Need any more brief of cyclonic downward change of economic climate? The incredible surprise announcement late May 7, 2008 by the MTA that it has reached an impasse with Tishman Speyer and that negotiations were ended for the deal to develop its 26-acre rail yards west of Penn Station was historic and raises many important questions. Jerry Speyer, the head of Tishman Speyer, which owns the Chrysler Building and Rockefeller Center and Stuyvesant Town among many other properties, flew to London to meet with Mayor Bloomberg two days after the MTA announcement, but there was no public indication that his company's plan has been resurrected. Indeed, an article by Charles V. Bagli in The New York Times May 8, 2008, reported that Tishman Speyer had "jettisoned its designs by the architect Helmut Jahn." The other ventures that had submitted bids were Extell Development, Brookfield Properties, a venture of the Durst Organization and Vornado Realty Trust, and the Related Companies. All of the submitted bids called for the erection of a platform to permit the continued use of the yards except for the one submitted by Extell that called for a suspended level over the yards. In the first round of bids submitted in October, the top bid of $1.049 billion was submitted by Related, followed by $1.015 billion submitted by Durst/Vornado, $908 million submitted by Brookfield, $819 million submitted by Tishman Speyer, and $598 million submitted by Extell. A second round of bidding was requested in February. Brookfield Properties did not submit a bid but indicated it could be involved as a co-developer, and Related submitted a bid only for the western half of the yards but not the eastern half. Extell submitted the highest bid in the second round: $1.15 billion. However, it did not agree to pay sales tax and that refusal led to its elimination in the bidding process. Related's second round bid was $943 million, Tishman Speyer's was $897 million and Durst/Vornado's was $842 million. The MTA then asked for more bids from the two remaining ventures and Tishman Speyer offered $1.004 billion and Durst/Vornado $892 million. Over the last few days, Durst/Vornado upped its bid but it still fell short of Tishman Speyer's. The Durst/Vornado plan included new headquarters for Condé Nast Publications and a much higher number of apartments than the Tishman Speyer plan, which attracted little enthusiasm from architectural and community commentators. The collapse of the Tishman Speyer deal is the latest nail in the coffin of Mayor Bloomberg's ambitious plans to rebuild Far West Midtown. It is hard to believe that none of the projects will be realized but all the major proposals have come across significant stumbling blocks in recent months. The grandiose plan to relocated Madison Square Garden to the west end of the Farley Post Office to facilitate the creation of the long planned Moynihan Station and a major upgrade to Pennsylvania Station apparently ended when the Garden recently said it has decided not to relocate and to renovate its circular arena. The Garden relocation would have opened up the potential transfer of several million square feet of development rights for Related Companies and Vornado Realty Trust in the vicinity. The planned extension of the 7 line from Times Square west on 42nd Street and down to near the Javits Convention Center has financial problems that have eliminated to date the creation of more than one station, dealing a serious blow to various development proposals along West 42nd Street and down a new diagonal boulevard planned from 42nd Street to 34th Streets between Tenth and Eleventh Avenue that the city had very significantly upzoned rather quietly during the Bloomberg Administration's attend to build a football stadium on the MTA yards. In May, 2008, Richard Rogers withdrew as architect of a planned expansion of the Javits Convention Center, a plan that was extremely modest in size but greatly out of context with the existing design by I. M. Pei & Partners. Rogers's withdrawal came shortly after the state indicated it had no money for a much more important expansion and was now contemplating selling off very important sites for any future expansion. The city's convention center is not even among the top ten in size in the country. All of these plans were bold attempts to transform the relatively dreary, lackluster section of midtown west of the very crowded Garment Center and around the traffic nightmares of the bus terminal and the Lincoln Tunnel into a huge new center with millions of square feet of first-class office space and thousands of luxury apartments. This "perfect storm" of collapsed deals obviously reflect to a certain extent radically changed economic conditions. The euphoric pipe-dreams are up in smoke, back-room smoke largely, and the turn around in the climate is so awesome that the silence is rather deafening especially since so many companies and observers have been insisting that the city is weathering the general economic malaise much better than elsewhere in the country. All of this dire talk, of course, might seem like the end of the world, er, city, but one should not forget how fantastic the building boom of the past few years has been and how it has transformed significantly almost every neighborhood in Manhattan and many in the outer boroughs. So catching one's breath may not be bad, especially since the new vacuum of super-project activity is an opportunity to rethink some of them very seriously and more importantly rethink the nature of their public review. Each project, of course, has its adamant adherents who proclaim theirs is the most important and no one has had an adequate chance to consider priorities in the flood of proposals that are very complex. For many preservationists, justifiable still outraged at the 1964 demolition of McKim, Mead & White's grand Pennsylvania Station, nothing is more important than making the miserable underground present train station more tolerable and many of these activists have vivid dreams of the city regaining a major and exciting portal. The plans to utilize the Farley Post Office building one block to the west caught the imagination of the late Senator Daniel Patrick Moynihan. That building does have a nice colonnade on Eighth Avenue but is otherwise not a masterpiece by any stretch of anyone's imagination and the plans were screwed up sometime ago when Amtrak lost interest in it and it would now mostly serve New Jersey transit. 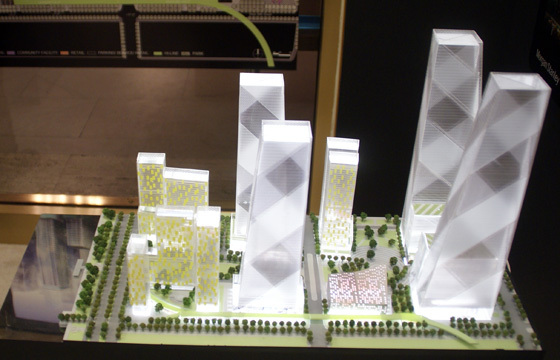 Far more egregious, however, was the MTA's selection of Tishman Speyer's proposal for its rail yards as the architectural and urban plan was the worst by far of the five submitted and clearly MTA's decision was basely solely on dollars, which recalls the tremendous controversy over the redevelopment of Columbus Circle where the decision was reversed at last because it had been based solely on money. Public agencies have public responsibilities and while fiscal responsibility is important so is not doing any harm, which does not narrowly mean to focus only on shadows and infrastructure but to see the larger picture, the grand vision of the city and its destiny and the aesthetic uplifting of the spirits of its citizens. All too often in recent years important decisions have been made that fly in the face of reason and all testimony and stink of back-room dealing. One cannot at the very last minute substitute a grossly inferior plan without public discussion for one that has painstakingly and agonizingly debated and voted upon in good faith. It's time for the city and various pubic agencies to clean up its act, and also to get autonomy from the state. One suspects we haven't heard the last of these troubled proposals. What is needed here is strong political leadership to sort out the mess and set priorities. The city will survive no matter what, but it should not only survive but constantly improve. The financial crisis is a good excuse to stop the music and rearrange the chairs.